Synopsis – The episode opens with happy people playing in a park. The scene is meaningfully intercut with Greg teaching the nerd how to accurately fire a pistol so he’ll qualify to work in the field as an FBI agent, rather than just as a profiler.. Back at the park, the idyll is shattered when three people are felled by rifle shots to the stomach. Back at the shooting range, we’re given the in no way obvious that it will come into play later information that Greg carries two guns, one in an ankle holster. Then Greg announces that when he first became a profiler, Mandy Patinkin told him that you don’t need a gun to kill people. Nerd doesn’t know what that means, but Greg assures him that by the end of the episode, he will. But will he? Finally the FBI gets a call about the sniper, only to have it revealed that they don’t like to use the word ‘sniper’ to describe them, but rather ‘LDSK’, or long distance serial killer. This is a semantic decision motivated entirely by PR – apparently profiling has never led to the capture of a sniper, so the public doesn’t have much confidence in Gideon and co’s ability to protect them from one. Of course, they’ve never caught an LDSK either, so it’s not like the name change is going to do their image a lot of good. As they debate the case, we learn that there is very little to go on in the standard profiler playbook when it comes to snipers. It seems that they’re so rare that the squad doesn’t know anything about them, beyond that they’ll try to contact the authorities at some point in order to take credit. The most important aspect of the killer is that he’s only killed one person, despite having shot six. Everyone is shot in the stomach, and only one person has died. They question if he lacks ‘the skill to make the headshot, or the will to take it?” Obviously this is a profoundly stupid observation – they’re suggesting that the stomach is the largest part of the target, and therefore the easiest to hit, which isn’t even close to the case. The chest is the largest, easiest to hit part of the body, and it’s far more likely to cause a fatality than shooting someone in the stomach. The fact that every target was hit in the stomach and not the chest is, in and of itself, proof that the shooter is both a skilled marksman and has no intention of killing his targets. Practically, it takes a more skilled marksman to NOT kill someone with a high-powered rifle, than to kill them. Also notable is the misconception that snipers prefer to make ‘headshots’ whenever possible. While it’s true that headshots are largely fatal, bullets to the heart and lungs are every bit as effective, and any sniper will tell you that if you’re looking to kill someone with a single shot you should absolutely go for the chest, because it takes a little bit of time for a bullet to reach its target, and while torsos are relatively stable, easy targets to hit, heads tend to bob and weave around quite a bit, making them an unusually difficult thing to aim for. Sadly, the image of dime-sized wounds on the forehead and brains splattering against walls is just too powerful to avoid exploiting at every opportunity. 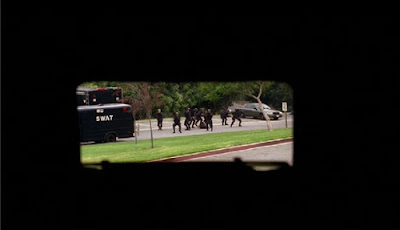 Once they reach the site of the shootings, the team announces that the sniper is likely a sadist, because he wounded his targets, rather than killing them. They also observe that the night before the shooting the killer painted a new handicapped space in the parking lot so he would have somewhere to park his car, meaning that he likely shot while concealed in the trunk. Over at the hospital, they meet a surgeon who’s both creepy and incredibly arrogant, so much so that he can be dismissed immediately as a suspect. Patinkin also explains that the reason all the shootings happened between 2:45 and 3:15 because that’s the police shift change, meaning there are almost no officers on the streets. As a result, the killer must be either a police officer or someone with intimate knowledge of police procedures. Over at the police station, they discover that the rifle used was an M4 assault rifle, whose relatively short barrel makes it normally unsuitable for long-range sniping, suggesting that the suspect as an expert marksman. Then the team gives their profile, announcing all sorts of generic facts about the killer, and then announcing that they want to re-enact the sniping to see if there might have been any witnesses. Things are queered when a reporter shows up at the park because someone on the police force leaked the information that the cop is a likely killer. Immediately they realize that the leak might well be the assassin, as, according to their profile, he’ll want to contact the media. Apparently all killers have contact with either their victims or the media, and since he’s a sniper, he can’t contact the victims. Unfortunately, it turns out the guy making the leak was the cop pretending to be the sniper in their exercise. As they force him out of the vehicle and start to take him away for questioning, the leaking cop is shot in the head by the real sniper, making them all look kind of like saps. And re-establishing visual media’s love of the headshot. Of course, this scene is utterly idiotic, because right after the shooting the audience is shown the killer’s location – just as the profilers suggested, he’s firing from the trunk of a modified sedan parked a hundred feet away whose license plate flips down to allow for easy targeting. Somehow, he isn’t immediately caught. The first question I’ll raise is this – since there was an active police operation going on, and the park was closed, how did another car end up in the parking lot? More importantly, after the shot, how could the shooter possibly have escaped? There was an entire swat team with automatic weapons just 30 yards away, so if he’d attempted to drive out of the parking lot he would have wound up riddled with bullets (cops can get trigger-happy when one of their number gets headshot). If he’d stayed in the car, how did he avoid getting caught when the police searched the area, a search that would have absolutely included the suspicious sedan parked nearby which is the exact sort of thing the beltway snipers drove. So how does the sniper make his escape? What brilliant tactic does employ to make his getaway? The greatest trick in the villain’s article: The show cuts to the next scene and no characters mention the escape, while the writers quietly pray that because the shooting happened right before a commercial break, and the next scene happened afterwards, no one watching at home will notice that they’re terrible at their jobs. People watching the episode on DVD, with no two-minute break between scenes will likely not be as forgiving as the original audience may have been. Annoyed that the killer hasn’t followed the profile and contacted the media, the team finally realizes the reason for his odd behavior – the killer must have contact with his victims, and since the shootings always happen near one of two local hospitals, he must not be a serial killer at all, but one of those medical professionals who cause injuries so they can rush in and play the hero. Immediately they suspect the arrogant surgeon because he ‘fits the profile’ of a ‘wannabe-hero killer’. In an amazing coincidence, the arrogant surgeon had been in the special forces. Of course, he’s was so incredibly suspicious in his two previous scenes that he can’t possibly be the killer, so I’m going to skip all the stuff about them discovering his iron-clad alibi. No, the real killer reveals himself (to the audience anyway), when Greg and the nerd head downstairs to check with a doctor who can confirm arrogant doctor’s alibi, the male nurse they ask about his location has a line – and since anyone who has a line needs to be paid thousands of dollars for ‘acting’, while those who just nod get only a few hundred as ‘extras’, we know the nurse is important. Couple this with the fact that the male nurse is played by popular character actor Timothy Omundsen, and you’ve got pretty firm confirmation that he’s the killer. Luckily, the profilers don’t have to do any work to figure out who the killer is - once Tim finds out that the cops are in the hospital he freaks out, grabs an assault rifle he had in his locker, and takes the whole ward full of patients hostage, including Greg and the nerd, who have their gun confiscated. While the team outside debate with the SWAT guys over whether or not to storm the hospital and shoot the place up, Greg uses his knowledge of profiling to ingratiate himself to Tim, presenting himself as another underachiever who feels that the system is keeping him down. Greg gets so into the role that he’s able to convince Tim to let him beat up the nerd, which was part of their devilish plan all along – I’m sure we all remember the awkwardly-established ankle holder backup gun from the beginning, right? The nerd grabs the gun and shoots Tim in the head, saving the day! Then we get one of the most confusing codas in the show so far, where the Nerd explains to Mandy that he finally understand just what it means that you don’t need a gun to kill someone. “But it helps!” It’s played a little like a joke, but it doesn’t really make sense. After all, the gun he had was completely integral to killing that guy. If Greg wasn’t crazy enough to carry two separate guns, they’d be ones who were dead. Maybe there’s a deeper message here that I’m just not getting. Especially when you consider the scene mid-way through the episode where Mandy reminded the nerd that the 'Footpath Killer' had a shotgun and he was unarmed, and he still won. Here's a tip, show, don't remind the viewers of the ludicrous scene where Mandy was able to overpower a man with a shotgun because that man spent two minutes not shooting the middle-aged guy that was teasing him about his stutter. Not especially – the first time around their profile was wrong, and only succeeded in getting a perfectly innocent police officer killed. Had they waited for a little more information (the geographical report that suggested a connection to the hospitals) before outright provoking the killer, they could have found him much more easily. Also, they didn’t really ‘solve’ the crime. The killer kind of just announced who he was. Actually, this time it was conventional police techniques that led to the capture. The fact that the murders were being committed at shift change suggested someone with a military background and access to information about police schedules. Had they just run down that list,Tim would have been found pretty quickly. Hell, they were at the beginning of this process when he just stood up and confessed. Well, confessed and took a room full of people hostage, anyhow. 4 – The insight about the killer wanting primarily wanting to wound people was a useful piece of information, but since it didn’t lead them to look extensively into the background of the staff at the local medical centres, it wasn’t useful in actually catching the killer. That being said, the entire police department relaly dropped the ball this time around, somehow unable to catch a killer hiding in a parked car just fifty feet from two dozen cops. Of course, it was Greg’s insight into Tim’s personality that allowed him to eventually defeat the sniper, so at least psychology played some role in the proceedings. Given the reveal of his identity, how did the sniper find out about the recreation of the sniping? They try to explain this away by having the characters announce that ‘cops talk’, but since the reenactment happened almost immediately after the briefing, there simply wasn’t time for Omundsen to hear about the reenactment, make his excuses at work, grab his gun, drive down to the site of the shooting unnoticed, kill a cop for no good reason, and then magically escape – they announce that his motive was to keep anyone from giving someone else credit for his crimes, but how did he know the cop being taken out of the trunk was suspected of the shooting? They discovered evidence suggesting this just minutes before the attempted arrest, and they didn’t give any specific information over the radio – there’s simply no way the killer could have known about it. Much like the arsonist and bomber episodes I’ve already covered, this Criminal Minds episode cheats by pretending to be about the team going up against the most uncatchable sort of serial killer, but then subbing in a much easier to catch villain when it comes time to wrap things up. Snipers are especially hard to catch because they don’t need to expose or put themselves at risk to kill someone, and if they’re trying to kill anyone, rather than a specific person, they’re basically impossible to catch. In contrast, hero-obsessed killers, who create medical emergencies so they can swoop in and save the day are caught all the time because hospital staff tend to notice when a suspicious number of people wind up being saved by the same unlikely person in the same way. Hopefully in the near future there will be an episode where the writers figure out a method to catch a really difficult suspect. And if that method actually involved profiling, even better! Previous episode "disposable cellphones are impossible to trace". This episode "call the number and I give you a real time location".